PERFECT FOR EVERYONE INTERESTED IN EGYPT. Required wall covering for every Egyptophile." 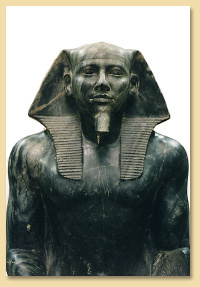 - an utterly unique and unequalled guide to the mysterious achievements of ancient Egypt. passages to the Turin limestone upper open air "courtyard"
and exactly where it was found, in pieces, just inside the entrance to the temple. 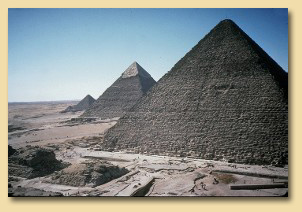 You'll be astonshished by the revealing photographs of the stonework of the Great Pyramid! you can see blocks that have been individually fitted on six sides! 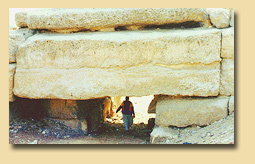 perhaps not simply a megalomaniac's tomb or a "lucky to survive" pile of bricks! immaculate lathe turned bowls from before the pyramid building dynasties! a great list of authors for further reading and research. You and your friends will marvel at the numerous mysteries detailed in this publication. 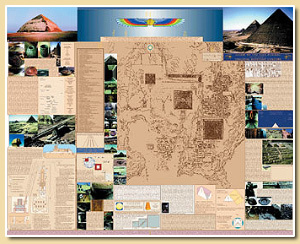 This poster guide map was the first ever published contour map of the complete Giza plateau showing all of the pyramids, tombs and mastabas to be combined with dozens of photos and an index to the exact location of hundreds of extraordinary features located on the plateau. 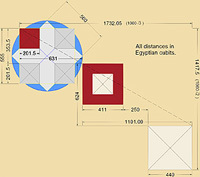 With this map, your interest in Ancient Egypt will be rewarded in a myriad of ways - some perhaps hard to imagine. BUT - Don't delay - There are now only a few hundred of the original edition of this poster left. plan a day's visit in advance - before dealing with the numerous guides on the plateau! show your guide exactly where you want to go and know that you are actually getting there! 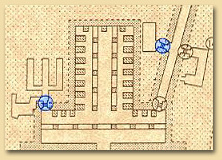 easily locate specific entrances, roads, toilets, the laser show pavilion & gift store, tombs, temples and dozens of unique features. Back home again, the poster guide will help you organize your photos and videos and it's a great help when explaining your adventures and experiences to your family and friends. It will remain an intriguing and educational souvenir of perennial interest. - Don't miss out - order now! 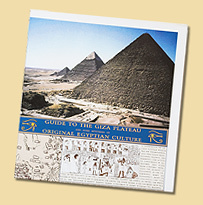 After ordering and studying this poster you'll probably have a better overview of the unexplained mysteries of Egypt than most people on the planet. You won't be wondering if such mysteries exist - you'll know! The unretouched photos and diagrams are the proof.